What is a biomarker? And can cognitive measures be used to predict biomarker measures? The National Institutes of Health Biomarkers Definitions Working Group defined a biomarker as “a characteristic that is objectively measured and evaluated as an indicator of normal biological processes, pathogenic processes, or pharmacologic responses to a therapeutic intervention.”1 We usually think of biomarkers as being measured in laboratory tests of blood or urine; things like proteins, toxins, or metabolites. Testing these biomarkers helps to measure an individual's risk for disease or disease progress, or occasionally gives information about a person’s risk for side effects or treatment response to a particular drug. But biomarkers for brain diseases pose particular challenges. The Blood Brain Barrier (BBB) means that what is circulating in the blood is, generally speaking, a relatively poor indicator of the state of the brain. More direct measures of brain function, such as functional or structural neuroimaging, EEG, and assays taken from cerebrospinal fluid tend to be relatively expensive or invasive to collect. Why are biomarkers important in clinical research? Biomarkers are key to being able to select the right patients for clinical trials, and to detecting changes and monitoring progress of a disease over time. Including biomarkers in the inclusion and exclusion criteria for study protocols can help ensure that patients are suitable for the research they are partaking in, avoiding the chances of unwanted side-effects and giving a new treatment the best chance to prove effective. Well-used biomarkers can, in both clinical trials and clinical practice, give an earlier read-out about a drug’s effects. In some diseases, biomarkers can be used as surrogate endpoints, shortening the time needed to conduct a clinical trial and hence get new treatments to market quicker. What can a cognitive biomarker do? Sensitive cognitive tests can be used as biomarkers in the sense that they can provide better characterisation of drug effects on the brain, earlier indicators of change over time, and better (more sensitive and/or less invasive) monitoring of change over time. 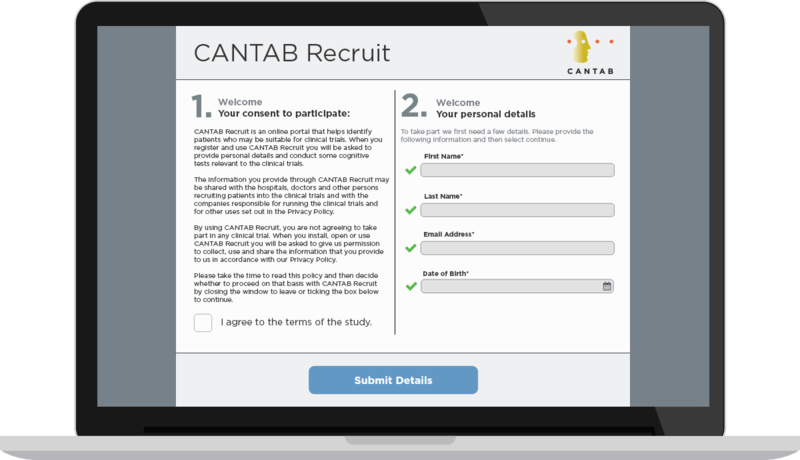 Cognitive assessments such as CANTAB provide objective valid and reliable measures of cognition. The outcome measures from CANTAB are designed to reflect the activity of different functional networks in the brain. Comparing CANTAB scores across different tests therefore gives a read of the relative strengths and weaknesses of different aspects of brain function – be that due to normal variation, aging, or disease processes. Our understanding of these relationships between cognitive biomarker & disease is based on more than 2,000 peer reviewed papers using CANTAB. As a primary endpoint in clinical trials, CANTAB tests can be used to definitively demonstrate the cognitive safety or efficacy of a compound. As secondary or exploratory endpoints, cognitive tests provide a cost-effective and non-invasive means of assaying brain function, aiding internal decision-making, dose-finding and drug repurposing. A major challenge currently facing those developing new treatments for Alzheimer’s disease is recruiting patients who have amyloid pathology in the brain, but do not yet show major symptoms of dementia. Here, CANTAB Recruit’s highly accurate measure of memory function can be used at home, to ensure that patients who do not have a characteristic memory impairment are ‘pre-screened’ out of the recruitment funnel, and enriching the likelihood of amyloid pathology among those patients brought into trial sites. CANTAB Recruit can significantly enhance the probability that someone presenting with memory concerns will turn out to meet amyloid imaging or CSF criteria for prodromal Alzheimer’s disease. Similarly, using CANTAB cognitive tests to establish the presence or absence of characteristic cognitive impairments can also support recruitment into clinical trials of other high need indications such as Parkinson’s disease, depression and schizophrenia. Contact Us to discuss how to optimise your patient recruitment strategy.